The more we learn about how the brain grows, adapts, changes and -- on the other extreme -- falls into patterns of thinking, the more we see that a leader's most important job is creating environments for innovation to flourish. Enhancing interaction during brainstorming sessions enables us to tap into our hardwired DNA and leverage the enormous capacity and deft flexibility of our brains to enhance innovation. Suppose you're invited to participate in a brainstorming session. The facilitator says that "every idea counts" and invites you to propose many ideas in the next 10 to 15 minutes. You feel rushed, and notice a push to come to consensus and begin doing the "real work" of implementation. The effort of organizing and narrowing the ideas then begins. Ideas are posted and you dutifully put dots on those you think are best. Next, you step back, see where the dots are densely clustered, and choose 10 good ideas. The facilitator posts them in descending order, and announces that the top three are the most supported. Then he does a "bake-off" of these three, and declares the winning idea. Of course, everyone is not on board with the chosen idea. Some people are willing to abandon their pet ideas; others go underground and create resistance. Some give up and give in, feeling that the mediocre idea won. This process is "innovation by committee." Mediocre ideas emerge, driven by the need to converge, reach consensus, and avoid conflict. This is a far cry from what we can achieve in innovation. We need to nurture the ideation process and allow room for divergence. People want to be connected to each other and be part of a winning team. This need for inclusion is a powerful drive. Our brains accommodate the complex interplay between individuals, groups, and societies. Similarly, we want to feel successful and competent. Thinking the same thoughts repeatedly lulls us into a sense of comfort. We think we know the "correct" answer, which reinforces feelings of intelligence and good judgment. We may not even realize we are in a repetitive loop, or experiencing status quo thinking. Instead, we feel good that we got it right. Thinking repetitive thoughts etches "grooves" into the brain. MRIs show that the gray matter nodes (regions of the brain that do the processing) are well developed. So is the white matter that connects those nodes. The brain is reshaping itself and reinforcing what it knows, perhaps at the expense of what is new and novel. Along these well-trodden paths, brain structure serves to link learning to behavior in predictable ways. We strive to find our comfort zone where we can project a positive image, be smart, and feel included. Sadly, these tendencies also inhibit innovation. Innovation likely resides in regions of the brain both overlapping and distinct from these well-developed pathways. Divergence, one aspect of new and innovative thinking, requires that we expand our ideas into the far recesses of our brain that may be less comfortable or familiar. Yet getting into those parts of the brain forges new connections -- both at the idea level and at the level of the brain tissue itself. We raise our Innovation IQ by making new brain connections daily. Facilitating divergence fosters new ways of thinking. Individual ideas are formed, tested, refined, brought forth and advocated for within a marketplace of ideas. We rarely give adequate time to this process or pay enough attention to unleashing the power of our brain to leverage this capacity. We raise our ability to think innovatively by making new brain connections daily. Facilitating divergence fosters new ways of thinking. Individual ideas are formed, tested, refined, brought forth and advocated for within a marketplace of ideas. We rarely give adequate time to this process or pay enough attention to unleashing the power of our brain to leverage this capacity. Remove the feeling of fear of speaking up by creating a safe space for people to have divergent thinking conversations with each other. Remove the feeling of judgment by allowing all ideas to have a life. Sometimes the worst ideas catalyze the best new ideas. Allow yourself and your team to live in the space of judgment free. Encourage people to challenge the status quo. Give them permission to spend time questioning what is ... and to ponder what could be. Our brain gets patterned to a current reality very easily. It's comforting. By enabling and encouraging people to challenge the status quo they become free to think in new ways. 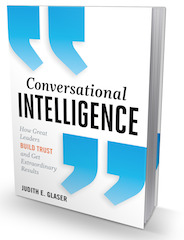 Judith E. Glaser, CEO Benchmark Communications, Inc. & Chairman of the Creating WE Institute; Author of Conversational Intelligence: How Great Leaders Build Trust and Get Extraordinary Results (BiblioMotion) October 2013. Order now on Amazon; visit us at www.creatingwe.com; www.conversationalintelligence.com; Rex Jung Ph.D., Brain and Behavioral Associates, PC; Assistant Professor, Department of Neurosurgery University of New Mexico; Jerry Manas, Author of Napoleon on Project Management, and Managing the Gray Areas.